Today Professor Putman mentioned in class the JFK and Nixon televised debate was in September 1960, it caught my attention. During the televised debate Nixon was very nervous, that he was pouring sweat and was not feeling well. John F. Kennedy was very relaxed, even had a tan and comfortable speaking. Most people listening on the radio thought Nixon won. People that watched the televised debate said John F. Kennedy was a blow out. I think it is interesting how appearance is how JFK won. This was the closest election in history. John F Kennedy only won by 100,000 votes. 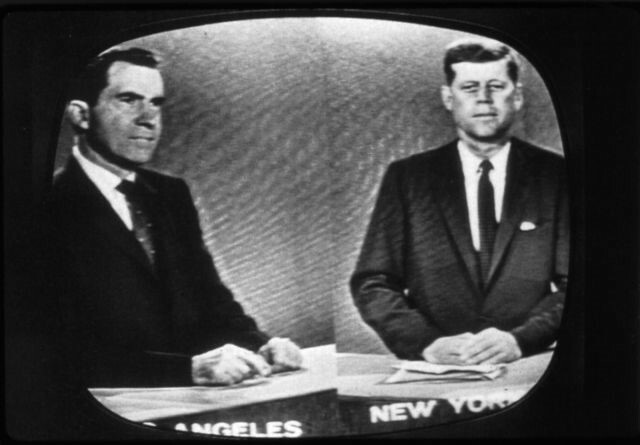 Below is a picture of the televised debate of Nixon and JFK.